This product is now obsolete and has been replaced by the SLFA-6000 X-ray Fluorescence Sulfur-in-Oil Analyser. 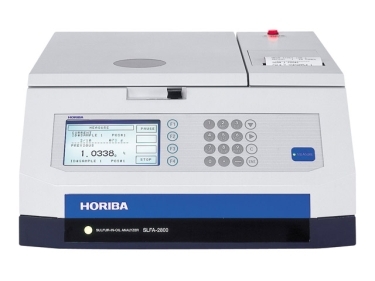 The Horiba SLFA-2100 & SLFA-2800 Sulfur-in-Oil Analysers combine existing and established functions with brand new functions in order to improve the easy of use and enlarge large the application. The environment today is facing many different problems. In order for people to prevent these, high precision analysis technology with high levels of sensitivity, precision and repeatability gain huge importance. The aim is to decrease the levels of sulfur content in diesel fuel, light and heavy oil. There are currently regulations concerning the sulfur content in these, which will inevitably become stricter in the future, particularly as the level of environmental consciousness is growing. Easy-to-read large screen - The measurements taken by the Horiba SLFA-2100 & SLFA-2800 Sulfur-in-Oil Analysers can be read easily and clearly using the instrument's large backlit LCD screen. Coherent large printouts - The 80mm wide printouts are understandable and enables modest reading. All of the required important information is printed such as the sample ID, date and time of the measurement, X-ray spectrum, number of accomplished measurements, measuring time, standard deviation, average value and calibration curve graph are shown on the printouts. Digital data output (RS-232C interface) - The measurement results can be exported to an external computer if the storing of results or further statistical processing is required. This also means that the Horiba SLFA-2100 & SLFA-2800 Sulfur-in-Oil Analysers can be used in laboratory of factory automation. Safety mechanism - No radioactive sources are used, so there is no risk when operating and maintaining the SLFA-2100 & SLFA-2800 Sulfur-in-Oil Analysers. Turntable for sequential analysis and priority measurements (SLFA-2800) - The SLFA-2800 model has a turntable, which enables up to eight samples with sequential measuring. This feature decreases the effort needed for each analysis considerably. It is also possible to do priority measurements at any time, even when the SLFA-2800 is analysing a single sample or a group of samples. New features that enlarge the application and make the use of the analyser easier. The Horiba SLFA-2100 & SLFA-2800 Sulfur-in-Oil Analysers has included several convenient new features without having to increase its size. Not only has the software been updated, but the measure range has also been enhanced and the analyser is presented in a new Horiba design. The new software has been designed not only to extend its application with new functions, but also to maintain a simple-to-use design. Users can choose between % and ppm for the measurement units. Sample identification allows users to include numbers (0-9) and alphabetic characters (A-Z) up to ten digits. The calibration graphs have been extended in the new SLFA-2100 & SLFA-2800 range. The analyser selects automatically out of seven scales (0.002 / 0.01 / 0.05 / … / 10 %). The graphs are in available in both units, % and ppm. The curve format can be either picked manually or set automatically, in either linear or parabolic. It is possible to store up to five calibration curves. You can choose between the analyser selecting the most suitable curve for you or you also have the ability to do this manually. This new model can measure a wider rage of sulfur content. It can measure between 0 - 9.999 % sulfur content in a sample. Consequently the equipment is applicable in more specific fields. Either a very small sulfur content as in diesel oil or a high sulfur content as in heavy oil can be determined. The SLFA-2100 & SLFA-2800 is an example of the new design philosophy of Horiba. The function keys have been rearranged, with the keys now arrange like cell phone keys, which makes operating and using the analyser far easier. Principle: Non-dispersive X-ray fluorescent (NDXRF) analysis. C/H ratio error: Within ±50 ppm/1 C/H, with sample containing 1 % S.
Optical path: Ambient air; He or N2 purges are unnecessary. Calibration curves: Automatic and manual selection of up to five curves; automatic and manual selection of either linear or parabolic format. Calibration: By optional standard solution; from 2 to 20 calibration points. Measurement time: Any time between 10 and 600sec. Relative humidity: 30% to 85%, noncondensing, atmosphere. Spectrum measurement: Standard on both models. Data output: RS-232C, output after measurement, auto calibration, and spectrum measurement. Mass: SLFA-2800; Approx. 24kg/53.0 lb. SLFA-2100; Approx. 21kg/46.4 lb.